Stanley (Firdous Bamji) plays the drum given to him by Meg (Judith Ivey). 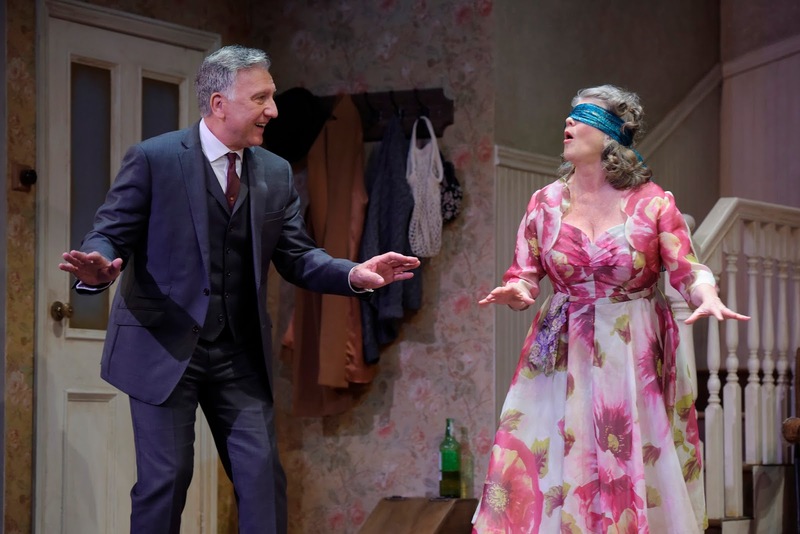 Seeming tranquility evolves into menace and more in Harold Pinter’s “The Birthday Party,” presented by American Conservatory Theater. It ends with uncertainty, leaving a trail of questions in its wake, yet it’s fascinating, especially as directed by ACT artistic director Carey Perloff. Their only boarder is Stanley (Firdous Bamji), a slovenly, unshaven former piano player who apparently has no current means of support. The simple-minded Meg flirts with him, but he ignores or rebuffs her. However, when he learns that two men had approached Petey the night before asking if there was a room for them, he becomes agitated and wants to know what they want. When they arrive, he sneaks out of the house. The men are the well dressed, smooth talking Goldberg (Scott Wentworth) and the thuggish, taciturn McCann (Marco Barricelli). McCann seems eager to do what they came to do as quickly as possible, but Goldberg is in no hurry. Believing it’s Stanley’s birthday (he says it isn’t), Meg insists on having a party, which includes her two new guests and Lulu (Julie Adamo), a young neighbor woman. Petey misses it for his weekly chess game. Before the party, though, McCann and Goldberg subject Stanley to a grueling interrogation with rapid-fire nonsensical questions. The party itself involves lots of alcohol, game playing and other activities that lead to no good. The next morning, McCann and Goldberg take away the now clean-shaven, neat but broken Stanley. Petey and Meg resume their routine. Although this is a brief summary of the action, it’s all of the undertones, pauses, discrepancies and changing balances of power that drive the drama. One can’t be sure of the characters’ motivations, but the quality of acting is unquestioned. Goldberg (Scott Wentworth) and Meg (Judith Ivey) play blind man's bluff at the party. There also are some laughs, many of them created by Ivey’s Meg. For example, her flouncing around in her party dress (costumes Candice Donnelly) is amusing because she believes she looks lovely while to everyone else she looks silly. Barricelli as McCann projects menace from the start, while Wentworth subtly conveys the menace that lurks beneath his smooth surface. Hiatt’s unflappable Petey and Adamo’s not-too-innocent Lulu complete the cast. The set is designed by Nina Ball with lighting by Robert Hand and sound by Darron L. West. This is Perloff’s last directing stint with ACT. She plans to leave her post at the end of this season, her 25th with the company. She will be missed, but she’s leaving an indelible mark with this production. 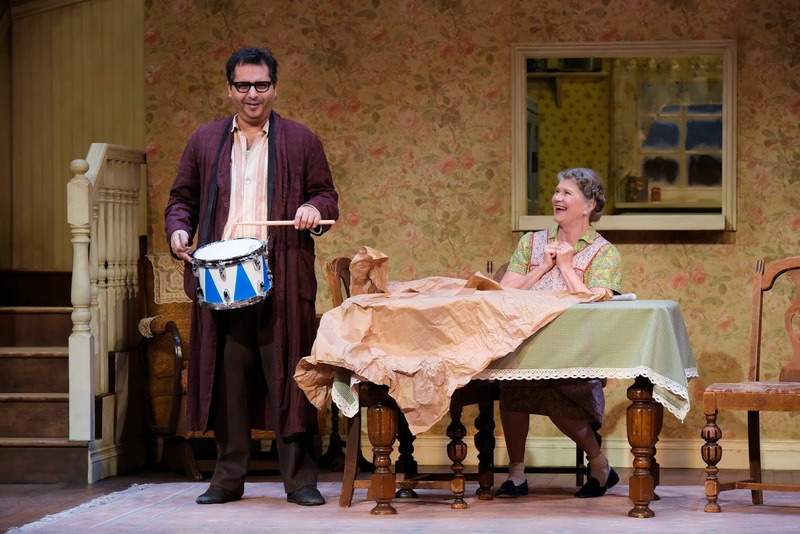 Running about two and a half hours with one intermission, “The Birthday Party” will continue through Feb. 4 in ACT’s Geary Theater, 415 Geary St., San Francisco. For tickets and information, call (415) 749-2228 or visit www.act-sf.org.